Throughout my life, there have been Christmas tree farms within just a few miles, often selling gorgeous Douglas fir for under $10 or Noble firs for under $20. Oregon is the cut Christmas tree supplier to much of the nation. Christmas tree farms are usually located on land that isn’t good for farming other crops. The thin soils around Tualatin, stripped by the Bretz floods at the end of the last Ice Age, were really only suited for the minimal needs of the trees, not the greedy roots of food crops. Grandpa said Tualatin was like farming on a doorknob, and was happy his farm was on the good soil of the Tualatin Valley instead. Each year while living in Tualatin, I’d travel all of two to three miles to one of many u-cut tree farms and saw down my own tree, strap it to the Subaru, and home again jiggity-jog. Each year I would discover that the tree stand didn’t fit and I’d have to buy a new one. One year I got a mighty Noble fir (any tree $15) that ended up about 16 feet tall and weighed too much for both Rich and I to pull upright. Somehow, I had managed to drag it in the patio door myself. We had to saw 4 feet off the bottom to eliminate the bottom branches so it could be uprighted, and even then was enormous. That puppy would have brought over $100 retail. Then the housing boom hit and the urban growth boundary was expanded and most of the tree farmers sold out to developers. I was unwilling to go further afield to source my trees and began to buy from the church lot or even the lot at the grocery store. The trees were still fresh because they were local, but far more expensive. I didn’t like spending $50 for a tree that used to cost me $10-15. Finally, I tossed it in and bought an artificial tree at the after-Christmas sale. I loved helping to support the local tree farmers and the boy scouts who would come by to recycle the old trees. But that era had passed. My ornaments were another factor. When I travel, instead of buying t-shirts or heavy stuff, I would buy an ornament of some sort to remind me of the trip. Many of them were too heavy for Douglas fir branches and required a Noble fir. Noble firs cost too much at retail prices. 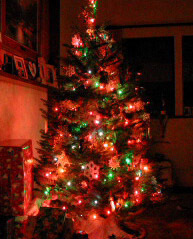 An artificial tree has no problem supporting the heavier ornaments. The Christmas tree reminds me of what our area of Oregon and Washington used to be, the land of Christmas tree farms. How many of those overpriced houses that replaced them are now in danger of foreclosure or can’t be sold? It’s a different world. I want to support keeping local farms alive, but it will have to be with a wreath or some other sort of holiday product.